Any kinds of rugs are made in part of camel’s hair, generally undyed and of a soft brown tone. They are praised as particularly desirable and durable, and antique specimens often showed a distinguished beauty. Modern examples are seldom improved by this addition to the wool. Camel’s hair, in the muggy days of summer, has the great fault of offending the nose and proclaiming not only that the “Campbells are coming” but that the circus and the whole menagerie is already here. If the camel’s hair part of your rug is soft and silky, it has been taken from young camels or from the camel’s belly, and the odour is hardly ever noticeable. Of wool in rugs generally it may be said that the best is from the younger sheep, and the silkiness and sheen of the wool give those same characteristics to the rug. Silk rugs, both antique and modern, fairly dazzle the eye with their beauty, but he who may afford one will needs afford also to furnish the surroundings for it in like magnificence. Otherwise all else grows pale and dull and leaden beside their refulgent glory. Place a piece of modern Dresden china side by side with a fine antique specimen of Chinese porcelain, and the garishness of the modern ware will give a pallid tone to the soft whites of the Oriental artist. But the fault is not with the older and perfect art; it is simply the old truth, in a new form, that evil colours corrupt and kill good colours. Be that as it may, old silk rugs are almost priceless, and of value to a millionaire collector for their originality of design and for their soft harmonies of colour which centuries alone can give. Modern silk rugs are mostly machine made, in part at least; are a detriment and a blot on any scheme of household decoration, and are always worth less than the price paid for them. By experience we may best learn how to choose a rug. As, for instance: never buy a rug, least of all at an auction, without thoroughly examining it. See its back as well as its face, and so be sure that it has not been cut, and that there are no serious holes in it. Quite one-third of the good old rugs will show some rents or tears, often made by the grappling-hooks as the bales are shipped and transhipped. If these are no bigger than a silver dollar, a skilful repairer, of whom there are plenty, will readily remedy the defect. Also hold the rug up to the light to know that the moths have not eaten it. Look at the nap and see that it is not worn to the warp. Lay it on a board floor, if possible, and apart from other rugs, and see that it lies flat and straight. None but those that are firm enough to lie well are desirable for use and general comfort. Of course many fine antiques are their own sufficient excuse for exception from this rule. If in doubt as to whether a rug has aniline dyes or been doctored or painted, a handkerchief moistened with the tongue may sometimes discover the truth. Painting a rug is a device not unfrequently practised when the nap is worn down and the warp shows white. Bear in mind that a good example may be so dirty as not to show half its merits. A sharp patting may scatter enough dust to display it in its proper colours, and you may thus, literally, unearth a treasure. Remember, too, that rugs never look so well or show as clear and bright when hanging on the wall as lying on the floor. Therefore, test a rug spread out flat before you in broad daylight. It is a trick of the trade to hold up one end of the piece exhibited and keep it waving to show its sheen. This is often a mere device to conceal its bad shape or other defects. If you are buying a rug for use on the floor, you should see it so displayed. Its sheen should be judged by walking around it and considering it in various lights. Note that with few exceptions the fringe and selvedge on a rug were not made for beauty but for protection. When the fringe is ropy, long, or uneven, or the selvedge eaten into or ragged, do not leave the rug to its unkemptness, but trim it religiously. 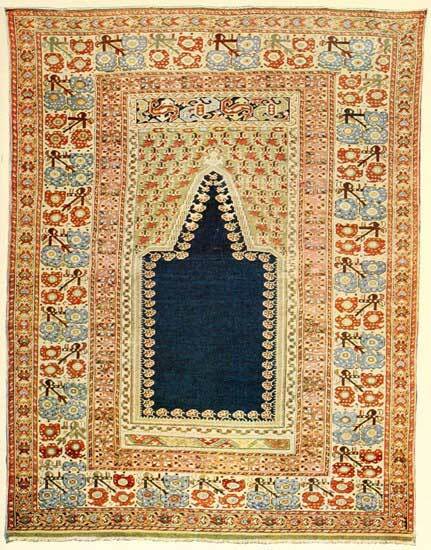 A man should have his hair cut and put in order at proper times; and the propriety of this observance is commonly preached on very many prayer rugs, where the comb is prominently pictured, to remind the devout that “cleanliness is next to godliness.” Indeed, the comb in various forms is so common a feature in the angular arch of most prayer rugs that its suggestiveness almost detracts from their beauty. The counsel is most persistent. Even the clean white fringe of a fine Persian is often so long as to need clipping. Two inches or so is a plenty. If more is left, the strings only curl under and show a ragged and broken line, and the rug never appears trim and orderly. When the selvedge is gone, and the end borders or sides of the rug itself are encroached upon and sawed by the tooth of Time, more than half of the value and beauty of the piece is lost; but to preserve its usefulness it should be overcast and further damage prevented. Never buy a rug as a perfect or even choice specimen if any border at the sides or ends is gone beyond repair. Every border should have its corresponding end, and vice versa, or the piece is imperfect. Selvedge is of slight importance, but, like a woman’s skirts or a man’s trousers, it is unforgivable if worn or frayed. The side edges which are otherwise still perfect are apt to become more or less ragged with wear. That is a detail, if the borders themselves are intact; and the edges only need overcasting before it is too late. When the good housewife has the rugs and carpets beaten, let it be done on the grass, if possible, and not when they are hung on a line and so allowed to break with their own weight. Also let the severity of the beating be tempered with kindness and discretion. In winter, sweeping with snow will clean and brighten them most wonderfully. This whole matter of cleaning is a neglected science and worthy of a thesis all to itself. The face of a rug will stand the slapping which is its usual punishment for being dirty; but do not forget, in the end, to stroke it, with the nap, and so soothe its feelings. Do not beat a rug or carpet on the back. That has no defence of nap, and you are liable to break the warp and loosen the knots. Frequent sweeping is far better than the brutality of constant beating. The wool of a rug is really a sentient thing. However dead it may seem, it has a life and vitality all its own. It can be quickened, rejuvenated, and made alive again by proper washing. Rugs in our modern houses easily accumulate dust and grime and smoke. But it is absurd to think that a rug is antique because it is dirty; or, more foolish still, that because it is dirty it is both antique and beautiful. Wash some of your treasures and you will wonder at their real glory and colour. Generally speaking, every rug should be washed about once a year. It is the Oriental custom; and carpets there are otherwise kept much cleaner than with us, by reason of many usages and observances. That the Orientals wash their rugs in cold water is not so. Wherever and whenever their laundering is done, the water is as warm as can be had, naturally. Milady washes her laces with her own fair hands, and delights in the task. The rug collector will do well, perhaps, to follow her example; except for the tender specimens, which must needs do without it, and the carpets, which are unmanageable. At all events, he will do wisely not to send his valued specimens to the ordinary carpet-cleaner. They may come back expurgated, but some virtue has gone out of them. The wool has lost its oil and life. It is hardly within the province of this volume to prescribe the exact methods of washing. Wool soap will do wonders, it being always remembered to stroke softly with the nap, while the rug is drying. In Kurdistan and neighbouring provinces the rugs are first soaked in milk of some kind and then rinsed, cleaned, and rubbed dry. The milk gives back to the wool its essential oil, and it becomes at once soft, shining, silky, and alive with glowing colour. This process, simple as it is, is kept as a profound secret by the few who know it in this country. Another Eastern method is to rub the rug with a mixture of rice-meal and oil, but the first recipe is by far the better. Rugs must be cared for particularly as to moths. When they are in general use the moth will not corrupt, rust, or break through and steal, as may be paraphrased from the Scriptures. The criminal indictment against the moth in this regard cannot be drawn too strongly. He is the collector’s great enemy, because he destroys. Age and even wear only ripen the perfections of fine modern pieces. Carpets and rugs stored, or laid aside, are not mothproof, wherever they may be; unless they are treated as in the great wholesale houses, where they are lifted and moved once a week and protected with the odorous moth-ball. When rugs have to be moved and packed frequently they should be folded differently each time, and not always in the same creases. Otherwise, wear and tear will soon show in the folds. For many obvious reasons they always should be folded away with the nap inside. But there are no new ones worthy of succession. The royal line is virtually extinct.